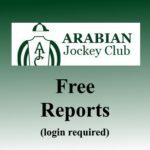 Please see Chapter 10 of the Arabian Horse Association Handbook for the rules and regulations for the registration of horses to be entered in Arabian Racing. The following forms may be required when registering a horse for racing. These forms can be obtained at the Arabian Horse Association website. The Certificate of Registration for Racing is necessary for a purebred Arabian to compete in pari-mutuel races in the United States. A horse will not be considered eligible to race until this certificate has been issued under the rules and regulations of the Registry. The certificate lists the horse’s name, registration number, owner, breeder, state foaled, four generation pedigree, markings, nominations, and official ownership transfers. The new Certificate of Racing Forms are available here on our Forms page. They can also be downloaded at the Arabian Horse Association Website. When a race horse has been sold, the horse must have its ownership officially changed because only authorized owners or their agents may enter a horse in a race. If the horse is at the race track, the transfer may be recorded through the Office of the Racing Secretary. The racing secretary, buyer, and seller must complete the Transfer for Race Horse form. If the horse is not at the race track, the buyer and seller must complete the transfer for race horse form. The Competition Visa is issued to a horse not registered with the Registry coming to the United States to race. The Visa certifies that a purebred Arabian, not registered with the Registry, meets the eligibility requirements of the Registry with respect to pedigree and parentage. It includes the horse’s name, markings and foreign race record. The Visa is good for 90 days and must be returned to the Registry upon the exportation of the horse for which it was issued. If the horse is to stay in the United States longer than 90 days, it must be permanently registered with the Registry. The Identification Supplement was used in conjunction with the Registration Certificate before the Certificate of Registration for Racing. It shows the horse’s name, registration number, breeder, state foaled, photographs, and official win record. Identification Supplements are no longer issued to horses registered with the Registry, but they are issued to Canadian registered horses that are racing. The Identification Supplement is still acceptable at race tracks.